Many aircraft owners have enough aircraft work experience and would meet the requirements to test for the license(s). Unfortunately, all that aircraft experience needs to be documented and approved by your local fed to be eligible. Many pilots, owners and former owners have mentioned that they wished they had kept track of their work over the years. That way, they could become an A&P simply by preparing for and taking the tests. Not to say the tests are easy, but they could because they had met the eligibility requirements. By using a ledger, you can keep an accurate log of the time you have spent working on your aircraft. The Experience Ledger for Airframe & Powerplant Eligibility ledger was developed by Brodhead Aviation in conjunction with the FAA to provide an easy and approved method to log the work you do on your airplane. 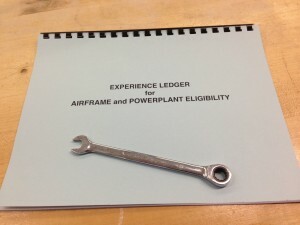 The Experience Ledger for Airframe & Powerplant Eligibility is available for $13.50 plus $3.00 shipping.